Pripyat is a ghost town in Ukraine, listed as a UNESCO World Heritage Site, as a monument to the most terrible nuclear catastrophe in world history. We have already seen it many times, but never in such an unusual form. Vladimir Migutin is a photographer specializing in infrared photography. 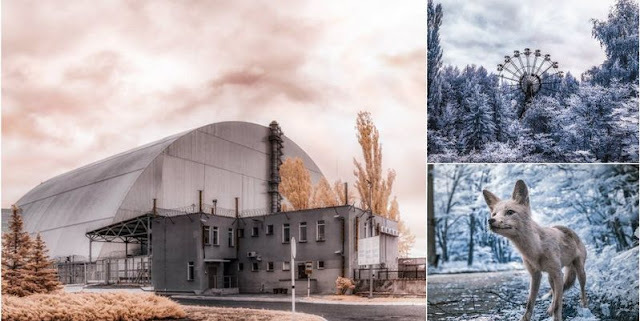 These photographs were taken during a 2-day trip to the exclusion zone of Chernobyl using a 590-nm infrared filter from Kolari Vision. The idea to close the razed-up vent of the reactor arose almost immediately after the explosion. In order to build the Sarcophagus over the ChNPP it took 7,000 tons of metal structures and 400,000 meters of cubic mixtures of concrete. And in order for the territory to be completely disinfected, more than 90,000 cubic meters of soil were removed. 1 Response to "Fascinating infrared images of post-apocalyptic Pripyat (Photo)"